accounting, merchandising, and accounts receivable for retailers. statistics, salesmens territory reports, and hourly payroll. for small ,jobs currently done on punched card tabulating equipment. Automatic coding includes a symbolic programming system. required to perform the operations and space is saved in storing instructions. Registers for easy program modification. Multiply-Divide times are for the Multiply-Divide feature installed. instructions or time is required to store results. Card input/output can often be overlapped with processing. completely overlapped with print storage installed. Both models have two read-write arms. Two tape units can be specified:       729 II or 729 IV. two lines/document. Reading is serial, left to right. Character rate varies due to high or low density tape option. balances and controls may be made. Automatic hole count check between read stations. Automatic Hollerith Validity check before storage entry. Automatic card to internal BCD input translation. Automatic internal BCD to card output translation. Automatic parity check of character to be printed. Automatic validity check of character to be printed. Hammer action to be performed. 1403 Printer - print storage. Input-output - column binary device. The KVA and power factor varies with manufacturer. Volume, computer  117.2 cu ft min. Area, computer     33.8 sq ft min. Room size         239 sq ft min. a 5 ton unit would be nearest size available. arrangement of the 1401 System units. (�10'%), 3-Abase (4-wire), 60 cycle (t 1/2 cycle). temperature 500 - 1100F, relative humidity 0 - 80%. recording temperature and humidity be provided. and improves the appearance of the installation. Over 2,800 systems have been sold to date. manufacturer and is included. in monthly rental. Varies considerably according to installation and application. includes programming and practical experience on systems. generator; subroutines; and debugging aids - service routines. system to 7007000 series, and simplified programming. the advanced card system, and the card and magnetic system. Optional features as required, are available. 850 St. Paul Street Rochester 1, N. Y.
Irving Place New York 3, N. Y.
with the exception of 1 729 II. 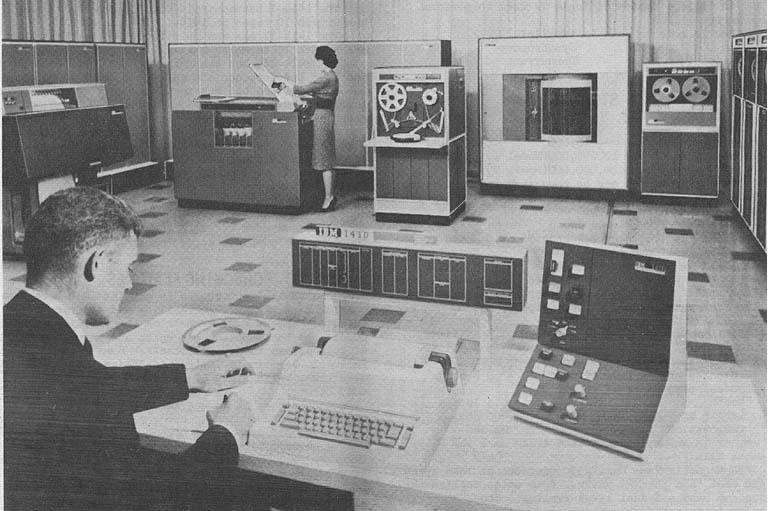 Shown here is an expanded RAMAC 1410 system. 1412 magnetic character reader used with the 1410 in banking applications. 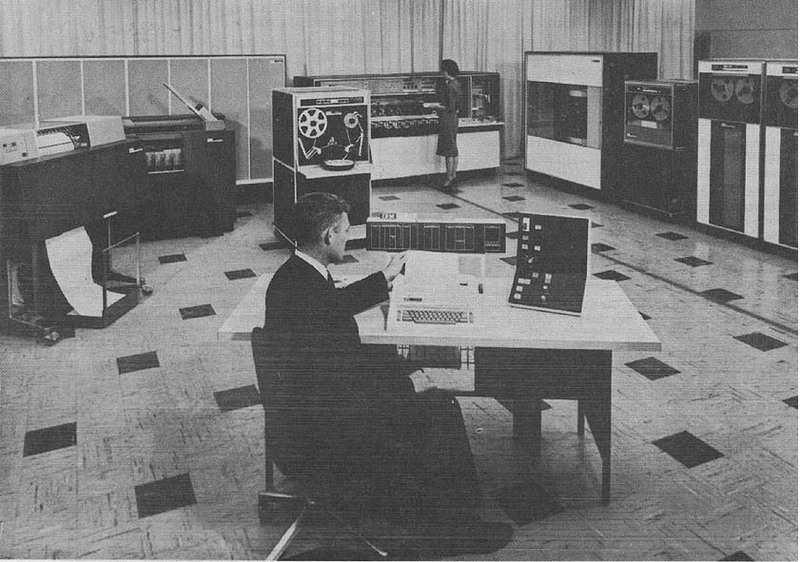 and two 729 magnetic tape units. The 1410 can handle a total of twenty tape units. 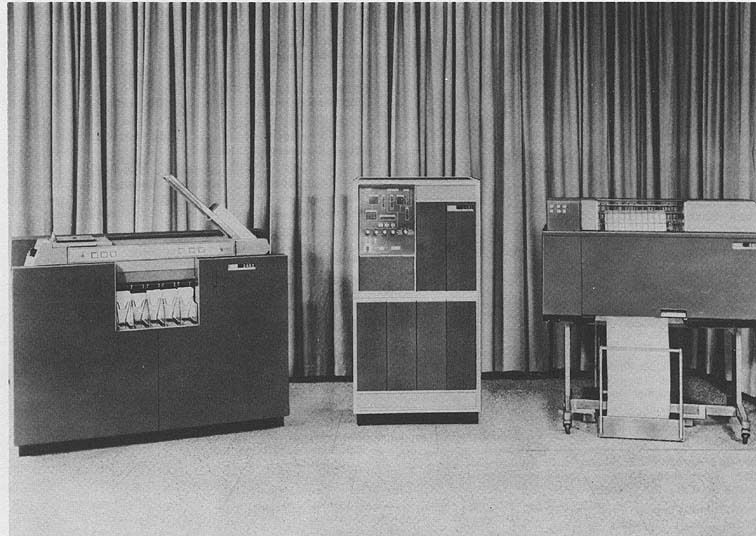 Tape System and the IBM RAMAC 1410 System. data operations, input-output operations and checking operations. devices used to do this are the address registers. storage location of the first A-field character involved in the operation. the storage location of the first B-field character involved in the operation. the operation code of the instruction in process. I/0 Channel Select Register, Unit Select Register, and Unit Number Register. number of that device such as tape drive 2. There are 15 Indexing Registers of 5 characters each. is indicated by the format and contents of the instruction itself. sorts, RAMAC sorts, utility programs, and COBOL. Mylar is DuPont's registered trade mark for Polyester Film. overlap device is on Channel 1.
overlap and dual gap heads for write checking. attach 10 tapes to 1414-I. attach 10 tapes to 1414-II. which uses 5, 6, 7, or 8 channel tape. valid signs of numerical quantities, and many others. broken tape, and card ,jams. 1410 system are parity, validity, and hole count. and turn on the read-check light on the card reader. punch-check station, and the two counts are compared. service clearance of adjacent units may overlap. presents a more attractive appearance of the installation. conditions in both the machine room and storage area. units     of the 1410 system. core memory, and high-speed operation are among features of the new computer. 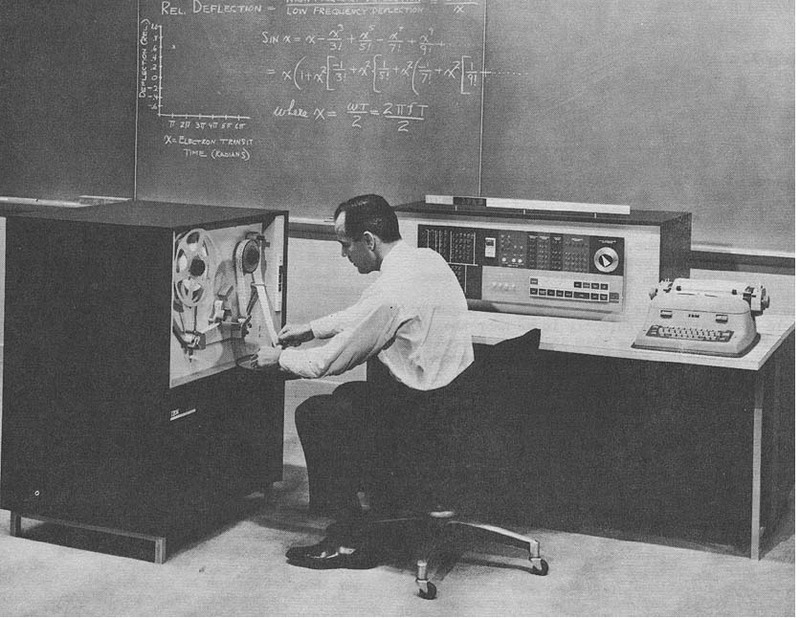 A general purpose computer in the scientific area that features magnetic core storage. general engineering, civil engineering, and electronics. American Machine & Foundry Co., Mechanics Research Div. instruction provides single instruction linkage to subroutines. Divide time includes loading dividends. Special air conditioning or site preparation are not required. includes group instruction in Fortran. use beyond the 176 is billable at the rate of 1/176th of the charge listed.